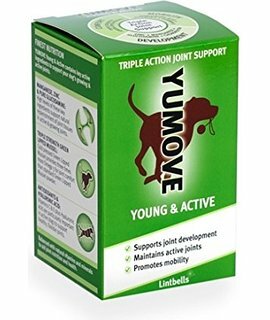 YuMove Active is designed for puppies, younger adults and canine athletes to support active and growing joints. Its agility and growth formula aids joint development promotes mobility, supports active joints and aids recovery after exercise. YuMove Active tablets can be used if your dog is already showing signs of joint problems or to protect the joints. 3. Hyaluronic Acid, which is a key component of synovial fluid. Synovial fluid provides cushioning & lubrication in joints during movement. 4. Manganese, which sustains ligaments & tendons. 5. Vitamins C & E, which are particularly important for dogs who are active or working. Free radicals can cause problems in joints over time & they are produced as dogs exercise. Vitamins C & E act as antioxidants, neutralising the free radicals, which helps to keep joints mobile. It is advised to double the recommended amount, for the first 4-6 weeks. Divide the amount & give morning & evening, if your dog is taking more than 1 YuMove Active tablet a day.